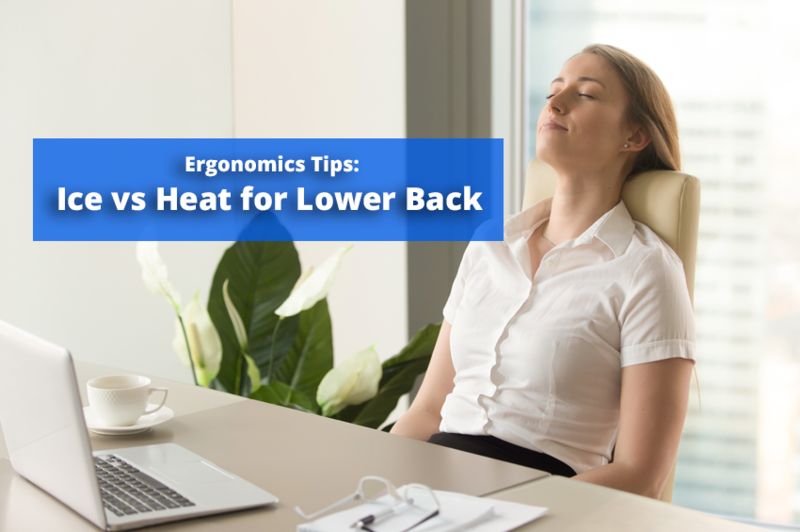 Ice versus Heat for Lower Back - Solutions Northwest, Inc. Whether your workstation has been designed by an ergonomic specialist or not, constantly sitting at your work desk can lead to lower back pain. In fact, 54% of Americans with sedentary jobs experienced low back pain. After a long day of sitting at work, you may want to treat your back pain, but should you grab the ice pack or the heating pad? If you injure your lower back, it is best to apply cold therapy during the first 24 to 72 hours. Cold therapy will help minimize inflammation and swelling, which reduces pain and can decrease tissue damage. While there are special ice packs designed for cold therapy, a frozen towel or even a bag of vegetables will do. However, it is important to be careful when using ice packs as they can burn your skin. Try using a cloth between your skin and the cold source. Do not use cold therapy for more than 20 minutes at a time and do not use it more than 10 times during a 24 hour period. After you use cold therapy to bring down swelling and inflammation, begin using heat therapy to encourage the healing process. Heat therapy increases the blood flow to your injury, bringing more nutrients to the injured area while flushing out the injured debris. Heat also increases tissue elasticity, which helps relieve tension and knots. For minor back tension, 15-20 minutes of heat therapy may be enough. For more intense pain, 30 minutes to 2 hours of heat therapy may be needed. Apply dry or moist heat (whichever you prefer) with over the counter heat pads, creams, saunas, or hot tub. An easy home remedy is to fill an old sock with rice or oatmeal, tie or sew it shut, and put it in the microwave for 1-3 minutes. Use caution to avoid burns, as you should be experiencing warmth and not intense heat. What if you don’t have a new injury, but just have chronic lower back pain from sitting all day at the office? In this case, there really is no right answer when it comes to hot versus cold. Everyone is different, so trial and error may be in order. However, some experts suggest that you should use heat therapy to loosen up your muscles for the work day and use cold therapy afterward to help with any pain and inflammation. Remember, when it comes to any kind of pain or injury, always consult with your doctor first. Also, be sure to get up and walk around every 20 minutes while at work and live an active life to help avoid any workplace injuries. For more health tips, exercise ideas, and suggestions to keep your workplace a healthy environment, check out our blog featuring advice from our ergonomics experts. For an ergonomics consultation to keep your workplace safe and healthy, visit SolutionsNW.com or Contact Us for more detailed information. Don’t forget to subscribe to our blog for more ergonomics tips from Solutions Northwest Inc., ergonomics consultants located in Washington State, Northern California (Arcata), Oregon, Seattle, Olympia, Tacoma, and Portland.